Learn more about our one-of-a-kind community and check out the latest happenings, updates and new photos. If you've ever wondered what it's like to be a Golden Oak Club member, you won't want to miss our 2017 Club Life brochure highlighting the best-ever package of Disney-designed experiences, services and extras to be offered by the Golden Oak Club in 2017. Our private recreational club brings a new dimension to living where the magic is endless – and now, you can read all about it. If you missed the printed copy of 2017 Club Life we recently sent you, please let us know and we'll be happy to send you another one. Just contact our sales team at (407) 939-5705. We look forward to speaking with you. Explore 2017 Club Life by taking a look at our e-brochure. Sorry! No matches were found with the specified filters. The portfolio of Four Seasons Private Residences is expanding—in a very magical way—within the private residential community of Golden Oak. This does not constitute an offer to sell, or a solicitation to buy, real estate to residents of any state or jurisdiction where prohibited by law, or where prior registration is required but has not yet been fulfilled. The story of Golden Oak begins in true once-upon-a time fashion. As a youth in Missouri, Walt Disney would lie beneath the spreading branches of his "dreaming tree" and let his imagination run free. It was here that Walt's talents for storytelling and fantasy began to take shape into some of the world's most beloved characters. Years later, a scenic ranch in California's Placerita Canyon proved an equally inspiring location for filming segments of The Mickey Mouse Club TV show. Walt Disney Productions purchased portions of the property in 1959 and, over the years, acquired more than 900 acres to reserve its quiet vistas for TV and movie productions and protect its harmony with nature. In fact, Walt and his family spent time relaxing and playing on the ranch. The name of this ranch? Golden Oak, in honor of a storied tree there, under which some say gold nuggets had been found in 1842. 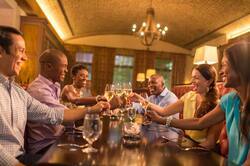 From these illustrious origins, the legacy continues with Golden Oak at Walt Disney World® Resort.